Armenian yogurt drink with fresh mint leaves. A Middle Eastern favorite and a wonderful thirst quencher. 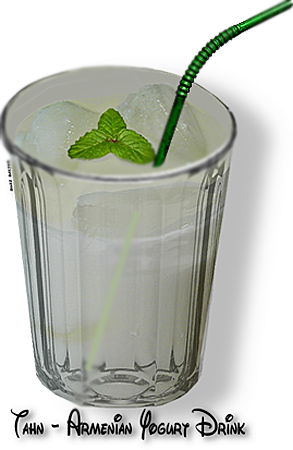 This drink is very similar to "ayran" in Turkey; "lassi" or "majjiga" in India; and the Persian "kefir" or "Doogh" (doh). 1. Mix the yogurt and water together until a buttermilk consistency has been achived. 2. Chill well and serve with a fresh mint leaf mint garnish.